What’s fresh from Massimo Ristorante? Round Up The World brings you a closer look at Ristorante Massimo, Sanur – Bali. See how Massimo Sacco prepares all the ingredients by himself and make sure all the dishes are served fresh! Introducing some of Massimo’s best treats. Massimo draws his inspiration from the culinary tradition of his hometown in Southern Italy. He serves the mainstays of traditional Italian food, which not only look authentic, but also have the real taste of homemade Italian food. “I don’t do fancy food. I just love to carefully pick my produce and ingredients. That’s how you get meals that taste real.”, says Massimo. Excellent Italian cuisine starts with the love for the product, yet Massimo’s singular approach doesn’t stop there. Time, he adds, is also a major factor in creating an exceptional taste. Commitment to quality means no frozen or processed ingredients and no pre-chopped produce. During peak hours, it could mean a little more waiting time, yet as many satisfied customers would readily attest, it's worth every minute of it. Bringing great food with a smile. 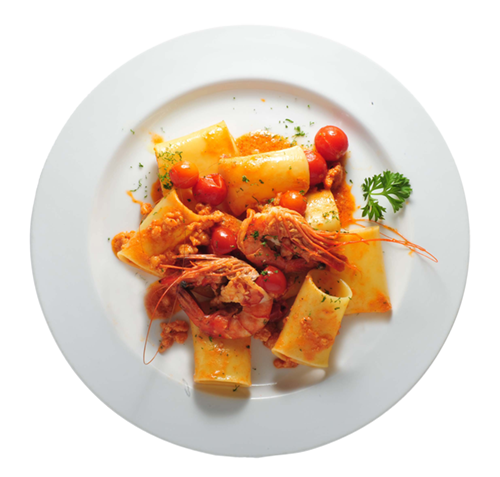 Massimo Italian Restaurant, in Sanur, Bali, has been serving authentic Italian cuisine in the culinary tradition of Southern Italy for more than two decades. Our running success can be attributed to the owner Massimo Sacco from a coastal town in the southeastern region of Italy known as Lecce. Chef Massimo began his delicious career in a culinary school in Italy. After graduating with honors, he furthered his skill at hotels and restaurant in Isle of Man, London and Frankfurt – before joining several international cruise liners. Today, the chef’s love for good food – Southern Italian dishes in particular – comes through in the simple, light, Mediterranean-influenced menu. Here, to keep it fresh, each dish is prepared when you order – to maintain the freshness of even the scantiest of ingredients. Yet, from years of experience, Chef Massimo knows that a great meal alone is not enough to put the restaurant on the map like it is today. It requires the best ambiance in the kitchen and throughout the restaurant. He is, of course, referring to the women and men who help him serve the best Italian food in Bali. “I know it’s a cliché to say that, but we’re all one big family here. I speak Indonesian, so there isn’t any communication problem, and most of the times we all feel like we’re happily sharing a home”, he says. The smiling staff around the restaurant is a testament to that. You will immediately feel this family atmosphere every time you visit Massimo Italian Restaurant. The place to go for authentic Italian dining in Bali. Massimo Italian Restaurant is located in Jalan Danau Tamblingan, one of the busiest tourist districts in Sanur. Once you are in the area, just look for a mouth-watering display of gelato in front of our restaurant. A big showcase of authentic homemade gelato is set up right by the sidewalk, often attracting a small crowd. Choosing from refreshing desserts, they often enjoy right on the spot. Our restaurant itself consists of three sections. Near the entrance is the garden sitting area with leafy tropical trees and plants providing shades for guests during the day. At night, this spot is a favourite for those who want to have a romantic, candle-lit dinner. Further inside the establishment is the large indoor sitting area. This section is furnished with long tables; perfect for groups and families. The last one is the air-conditioned section where guests can enjoy Massimo's delectable offering in utmost comfort. Indeed, Massimo has long been the place to go for intimate family gatherings or festive celebrations. Whatever the occasion is, Massimo offers an unrivaled authentic Italian dining experience in a tasteful setting where there’s truly something for everybody. 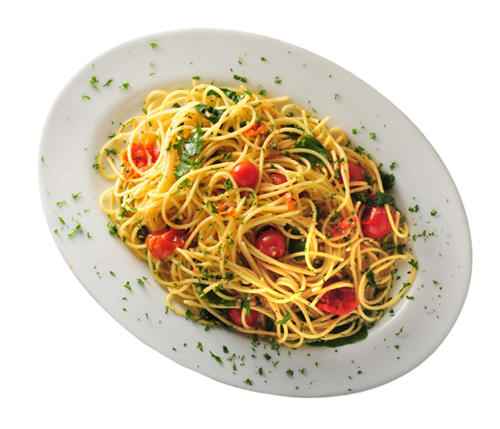 Pasta is arguably the most important of the Italian dishes. It is so popular that the Italians have many different ways to prepare it. The following recipes from Massimo will give you a taste of the world-famous culinary tradition that has been passed down for generations. Cake: 150 g butter, 150 g sugar, 300 g	flour, 4 pcs egg yolk, 1 pc grated lemon skin. Filling: 400 g homemade orange marmalade. Preparation Method: Put flour and butter into a food mixer and blend until grainy. Then blend in the yolks, sugar and grated lemon skin. When ready, wrap it in cling-film and leave in the fridge for 2 hours. Roll the dough to a thickness of 0,5 cm, use it to line a cake pan then prick the pastry all over with a fork. Lay the orange marmalade filling into the lined cake pan. Make strips of pastry and lay them crisscross across the top of the cake. Bake for 45 minutes at 180 degrees. Cake: 150 g butter,150 g sugar, 300 g Cake Flour, 4 pcs egg yolk. Filling: 145 g cooked wheat, 145 g sugar, 145 g fresh Ricotta cheese, 2 pcs egg, vanilla to taste, orange and lemon zest, grated orange flower water. Preparation Method: Put flour and butter into a food mixer and blend until grainy. Then blend in the yolks and sugar. When ready, wrap it in cling-film and leave in the fridge for 2 hours. Roll the dough to a thickness of 0,5 cm, use it to line a cake pan then prick the pastry all over with a fork. Put the ricotta into a bowl and mix in the sugar. Add remaining filling ingredients and mix well. Lay the filling into the lined cake pan. Make strips of pastry and lay them crisscross across the top of the cake. Bake for 45 minutes at 180 degrees. Before removing from the tray, wait until it has cooled enough. Ingredients (for 4 people): 12 slices of thin-sliced beef tenderloin (50 g each), 12 slices ham (15 g each), 120 g grated Parmesan cheese, chopped parsley, Extra-Virgin olive oil, salt. Preparation Method: Place the beef slices between 2 pieces of oven paper and flatten with a mallet. Place on each slice of thin tenderloin one slice of ham, Parmesan cheese, chopped parsley. Carefully roll up the beef slices and secure with toothpicks. Drizzle extra-virgin olive oil over the beef rolls and place on the hot grill. Cook for about 5 minutes then brush more extra-virgin olive oil, turn and grill until cooked for about 5 more minutes. Ingredients (4 persons): 1 kg squid, 1 kg prawn, 500 g flour, salt, lemon Juice, frying oil. Preparation Method: Start by cutting the squid into rings. Wash and pat dry the rings and prawns. Toss them in the flour in small batches just before frying. Fry them in hot oil until golden. Drain well; squeeze some fresh lemon then lightly salt to taste. Enjoy your crispy, light and tender squid and prawn. We serve at restaurant with rice fritters and French fries. 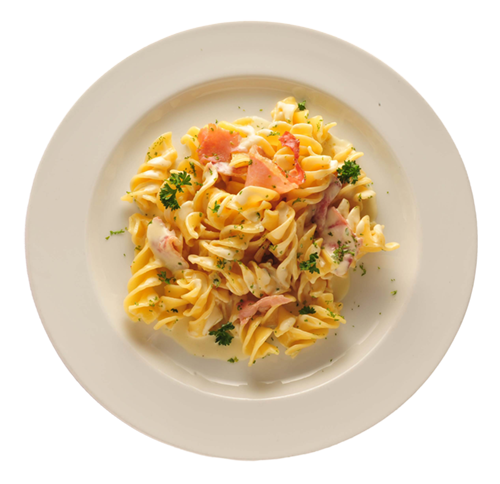 Ingredients (for 5 people ): 500 g jumbo-size Fusilli pasta, 50 g butter, 100 g Gorgonzola cheese, 15 g Parmesan cheese, 15 g Pecorino cheese, 10 g Mascarpone cheese, 500 ml cooking cream, 75 g Parma ham. On a low heat, add the butter and the Gorgonzola cheese to the pan. When the cheese starts to melt, add Parma ham and cooking cream then cook for couple of minutes until the sauce is reduced and thicker. Shortly before the pasta becomes al dente, add remaining Parmesan, Pecorino and Mascarpone cheeses to the reduced sauce. Stir it briefly, then add pasta to sauce and serve. 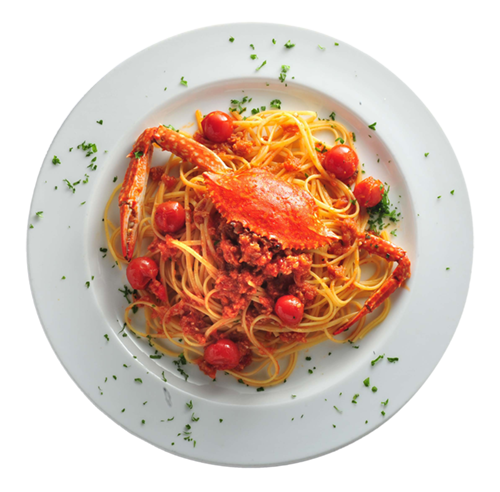 Ingredients (for 5 people): 500 g Linguine pasta, 150 ml extra virgin olive oil, 50 g chopped garlic, 2 g chopped chilli, 7 g anchovies, 300 g fresh crab, 400 g cherry tomatoes, 200 ml white wine, 15 g chopped parsley, Salt. Preparation Method Preparations start with extracting the crab meat from the shell. Rather than throwing it away, clean the shell. It’ll make a great garnish for the dish later. Fry some garlic in extra-virgin olive oil until soft. Add the chili and the anchovies. Cook for 30 seconds. Add crab meat and cook for an additional 30 seconds, then flambé in white wine. Add the cherry tomatoes and keep the sauce on low heat for 2 minutes until it’s reduced and thickens. Add salt to your liking. When the pasta has become al dente, drain it then add it to the sauce. Stir in the chopped parsley, and serve. Preparation Method: Start by cooking Spaghetti pasta in boiling salted water for approximately 7 minutes until al dente. While waiting for the pasta, prepare the sauce as follows: Fry up some garlic in extra-virgin olive oil until soft. Add chili and anchovies. Stir briefly before adding cherry tomatoes and salt to your liking. When the pasta has become al dente, drain and then add it to the sauce. Finally, add fresh rocket lettuce and chopped parsley. Mix well. Serve hot. Fry onions and garlic in extra-virgin olive oil until soft. Add whole prawns and chopped shrimp. Cook for 30 seconds, then flambé with white wine. Pour cooking cream into the prawn sauce and cook for 1 minute. Add cherry tomatoes and keep on low heat for 2 minutes until the sauce thickens and is reduced. Add the freshly ground black pepper. When the pasta has been boiled for 12 minutes and is al dente, drain and add it to the sauce. Add the chopped parsley, salt according to your preference, and serve. Massimo Restaurant will assist you to organize your wedding. Let us personalize the décor of your special day from classical to casual! Let's work together to create an unforgettable day that reflects your own personal style.